Nectarine verses from Śrī Kṛṣṇa-karṇāmṛtam (Nectar to the ears of Lord Kṛṣṇa) in which the Sage Śrī-Līlā-Śuka, also known as Bilvamaṅgala-Ṭhākura, has described the beauty of Lord Śrī Kṛṣṇa comparing Him to the moon. Let my words express even a tiny particle of a particle of a particle of the luscious beauty of Murāri, whose artless adolescent figure enraptures me, and whose moon-face is worshiped by the soft melodies of His flute. 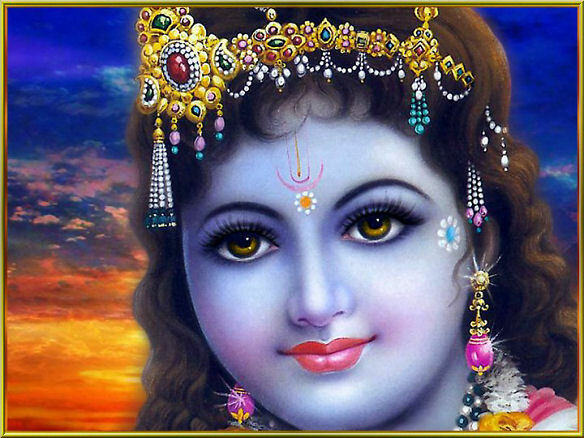 May my mind float along in the flood of bliss emanating from Kṛṣṇa's moonlike face, made charming by a very mild smile. Kṛṣṇa has the appearance of a young boy, and, beautified by the waves of His passionate ecstasy breaking in the ocean of sweetness, He soothes all distress. May there appear in my mind some of the ecstatic states of very charming Śrī Kṛṣṇa. As He glances at the milkmaids' sweet moonlike faces, agitating them with joy, He seems to be kissing them with His half-closed eyes. As He begins sounding His flute, He assumes the attitude of an adolescent youth. When will that child [Kṛṣṇa], adorned with peacock plumes, soothe and cool our eyes with a vision of His moonlike face, imbued with gentleness by the trickling honey of His tender smiles? O moonlike Kṛṣṇa, please soothe and cool my eyes with Your sidelong glances, tinged with mercy; with the magnificence of your childhood, touched by youth; and with Your wondrous playfulness, which nourishes the whole universe. O Lord, until some terminal disease comes to strike violently at my vital parts and cripple my limbs and joints, may the moon of Your face by the double-thick awning for the current of my consciousness [against the burning heat of separation]. Till the tenth stage of man (death) comes upon me through some physical defect, enveloping me in total darkness, let me ever see the orb of Your moon-face, which is the abode of both the pastimes of beauty and Your high-sounding flute. The adolescent loveliness of Mukunda, whose appearance enraptures the connoisseurs, clings to my mind, which is always fond of drawings from the libertine tradition. His moon-face is cherished by the moon itself, and the softly glowing rays of his lips redden His gentle smile [or, His kunda-flower-like teeth are reddened by the effulgence of His gentle smile]. I am absorbed in contemplating my Lord, whose eyes resemble luscious lotuses gently developing their beauty under the rays of the sun, and whose moon-face is full of beauty, being exhilarated with delight at His having defeated the milkmaids in the lovers' quarrels. He comes before us-the cooling balm for our eyes-wearing many tinkling ornaments on His body and a peacock feather on His head. His forearms are swinging, His eyes move restlessly with the agitation of love, and the moon of His lotus face displays a tender, gentle smile. This child (Kṛṣṇa), who is the ornament for the intimate community of cowherd boys and girls, whose lively glances are so soothing, and whose moon-face has a wealth of soft, tender smiles, gladdens my heart and enters deep within it. This person approaching me is dark bluish like a tamāla tree. His charming eyes, which resemble stars, move restlessly, the shining orb of His moon-face is overflowing with delight [or, His face radiates joy like the rising moon], and He sportively begins sounding His flute. He is my very life. Oh! My good deeds have reached their culmination: Kṛṣṇa has appeared before my eyes! The moon of His face is made doubly refreshing by its sweet tenderness, and He sprinkles me with the current of nectar dropping note by note from the holes of His flute. He is the object of my words, which, though mad, are fortunate [to be describing Him]. With the rising of His moon-like face this certain person known as Kṛṣṇa is nourishing the faded lustre of the cooling moon and doubling the ocean of my thirst [to see Him]. He is my very life. O Keśava, what is this bright glow of Your moon-face? What is this appearance of Your's, which is beyond description? Let that [glow] and that [appearance] be relished [by Yourself or by those souls competent to do so]. I simply bow down before You again and again, and yet again. O Lord, the moon, having been conquered by Your moonlike face, has taken shelter at Your feet and split into ten parts-that is, Your toenails-thereby gaining much greater brilliance and beauty than before. O Lord, how great is even a slight manifestation of Your mercy!